With Windows Phone 8 being the only operating system that Nokia is working on right now (RIP, Symbian), the Finns have taken care to add as much value to the Lumia brand as possible. And since Microsoft doesn't really allow UI customizations, adding value translates to supplying exclusive apps and services. The Nokia Lumia 1020 comes with the new Amber update preinstalled but that doesn't change the user experience dramatically. It does add a few features like Glance Screen, FM radio support and a new camera lens (more on that in a minute) but the rest is barely different from the previous WP8 iterations. The Nokia Glance Screen is one of the coolest features that the Amber update brings along. It's a tribute to the MeeGo lockscreen (and Symbian smartphones of old), where you can constantly see a clock and flags for any missed events right on the black standby screen. And just like on the Nokia N9, Glance screen lets you to wake up the phone with a double tap. The feature leverages on the AMOLED screen to achieve very good power efficiency as only the pixels needed to display the clock and notifications are lit up. There are several options to the Glance Screen feature. It can either be Timed (after a pre-set period of time it turns off the screen completely to save battery) or always on, if you want to be able to see it at all times. Weirdly, the Lumia 1020 missed the fourth option called Peek, which is present on the Lumia 925. It allows you to wave over the phone's face to display the clock and notifications, much like Samsung's Quick Glance. If you don't need the Glance Screen feature, you can disable it altogether. Then you will simply have to push on the unlock button to reveal the lockscreen. It displays the current time and date and shows calendar events, emails and missed calls. There's a reasonable level of flexibility and functionality to the lockscreen - the Live Apps service allows apps to display notifications and images. You can set one app to display big notifications ("detailed status") and up to five more apps to show less ("quick status"). Windows Phone 8 lets you resize the live tiles. Upon a tap and hold, you'll get an extra resize button, next to the unpin one. You can opt between quarter, normal and double size. If you select the smallest one though, the tile will be just a static icon (as is in the regular menu). Most Live tiles display relevant info such as the current date, pending calendar events, missed calls, unread emails and more (third party apps do it, too). The Marketplace tile displays the number of updates available, while the Pictures tile is essentially a slideshow of your photos. It's nice to have all that info always available at-a-glance. You can look at them as homescreen widgets of sorts. WP8 can do multitasking - well, not true multitasking, but more along the lines of iOS. Apps not in the foreground are suspended, but the OS has ways to take over and carry out the task for them (e.g. continue playing music). But just like Apple's iOS, if an app needs to run in the background (sat-nav apps, messengers, etc.) it can. The WP offers both kinds of multi-tasking and it's up to developers to choose how their apps behave. To switch between apps, you press and hold the Back key. You'll get thumbnail snapshots of the apps, ordered chronologically left to right. You can scroll the list horizontally to select an app and a tap will bring you back to your running or suspended app. You can't "kill" any of those apps from here - to exit one, you must bring it to front and use the Back key to close it. If you keep on hitting the back key, you will effectively be closing all of the open apps one by one, which is very unnatural, especially when you've got an open Internet Explorer, which has to go all the way back to the first loaded page before it closes. Overall, it's best to let the OS manage the apps and not worry about which ones are opened or closed. Another feature we feel is missing is a place where you can see all of your notifications from various apps. Live tiles manage to show notifications from each app to some extent, but they don't really have enough room for things like e-mail subject and such, while Android and iOS notification areas do. Microsoft has confirmed that it's working on just such a feature and that we should see it in a future update to WP 8, although recent rumors point to that being delayed to 2014. Being a WP8 handset, the Nokia Lumia 1020 also supports voice commands - you can dictate or have the phone read text out, you can initiate searches and so on. Unfortunately, the Windows assistant is still far behind the competition as far as recognition speed and accuracy are concerned. The Lumia 1020 also comes with the Data Sense app, which shows you the amount of data you've used. Both cellular and Wi-Fi traffic is accounted for. There are different data limit types: one-time, monthly and unlimited. The first two accept custom bandwidth limit values, while the latter is applicable if you have an unlimited data plan, but would still like to track your usage. The can also restrict the background data usage for all apps, provided you're near the data limit that's been previously set. This will prevent some apps from functioning properly, though. The new Nokia Lumia 1020 features the nicely helpful Kid's corner. You can select the apps and the types of media content that goes in and password-protect it, so you can safely share your smartphone with your kids without worrying that they will mess up your settings or access inappropriate content. When activated, the Kids corner is accessible by swiping left of the lockscreen. If you've secured it, your kids won't be able to return to your standard lock and home screen without the password. 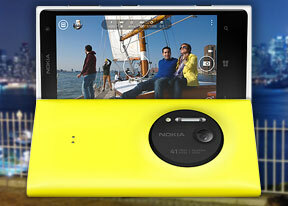 The Nokia Lumia 1020 uses the Qualcomm MSM8960 chipset (1.5GHz dual-core CPU, 2GB RAM and Adreno 225 GPU). That's as good as it gets for WP8 devices at this stage, although Android competition has pulled quite far ahead - the LTE-Advanced Galaxy S4 already broke the 2GHz barrier and with a quad-core Krait processor at that. A good thing is, the WP8 platform doesn't feel sluggish at all . Navigation is fast and animations are nicely smooth and fluid. There are places where you can feel a bit underpowered - loading heavier apps like Drive+ takes longer than it should on a flagship device and using the Camera Pro app to simultaneously capture full-res and downsampled shots simultaneously extends the shot-to-shot time significantly.